Do you happen to be relocating for a new job? Are you looking for a short term rental for another reason? You have come to the right place. Elite Housing Solutions has multiple Tampa furnished apartments that are perfect for your short term housing needs. Picture this for a moment... You've been hired for a fabulous new job in the Tampa Bay area, but your house hasn't sold yet so you can't buy another one in Tampa. You start your new job next week but Tampa is 1,800 miles away. What are you going to do? Where do you stay? One option would be a cramped expensive hotel room where you feel like a caged animal and you must eat out for every meal. By the time you have been there for two weeks, you will have had everything on the menu and it will be adding inches to your waistline !! How exciting and practical will this be as you start your new job. Not very, right? And oh ya, I forgot to mention, it's expensive to eat out for every meal so there goes that raise you got with your new position right? Well, not to worry any longer! Elite Housing Solutions has the perfect remedy to your dilemma with Tampa furnished apartments that are up to 50% more cost efficient than a hotel room. 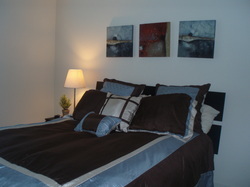 Our Tampa furnished apartments also provide you with surroundings that are relaxing and more similar to your own home. Think how nice this atmosphere will be with all the stresses of that new job. No need to worry about who is going to knock on your door next, or who the new neighbor is day after day. With ideally located, well appointed Tampa furnished apartments, that are also typically 50% to 100% larger than a hotel room and have full size kitchens and washers and dryers to boot, you can't go wrong. With Tampa furnished apartments located in almost any area of greater Tampa Bay, our inventory is large and very diverse. From the most opulent executive suites to the very basic furnished apartment, Elite Housing Solutions has the perfect selection of Tampa furnished apartments. Certainly, with our selection of Tampa furnished apartments, we have the one that will be perfect for you and your family. Let Elite Housing Solutions take that overwhelming big item off your list – we will find the absolutely perfect living place for you to begin your new adventure. Search no further for Tampa furnished apartments. Call Elite Housing Solutions today at 813-626-7772 to find the perfect Tampa furnished apartments that are within your budget and in the location you need. You can also fill out our simple contact form and we will get in touch with you.